To be fair there are three seasons of The Original Series you can mine with pleasure for this and I have to admit that my selection is straight from those classic vaults - but not necessarily one you might immediately think about. As we head through The Next Generation there aren't any that spring to mind since Picard was a stickler for regulation. The less said about Sisko's decisions in the final couple of years of Deep Space Nine the better but Janeway was again one for sticking to the rules as best as possible. Archer? Well he didn't have to worry about the Prime Directive - it hadn't been invented although there were a couple of occasions it should have been in use. So to my choice and it could strike up a few comments. 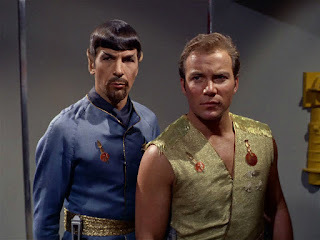 How about Kirk's decision to incite Mirror Spock to turn against the principles of the Terran Empire in Mirror, Mirror? Talk about non-interference, the captain manages to change the future irreparably as we see in Deep Space Nine thanks to goatee-toting Spock's rise to head of the Empire and disarmament of the fleet. With only a few lines Kirk alters an entire timeline and effectively places humanity into slavery for nearly a century. Great move and a prime example of Kirk disobeying the Prime Directive because he thinks he knows better. Sadly it just provided the chance for another equally violent faction to seize power and carry on the "good work". I would expect this to be one place Captain Kirk is not the reverred hero! OK his heart is in the right place but there's no long term thought here - it's all about what is happening in front of his eyes on one ship at one point in the galaxy spanning Empire. 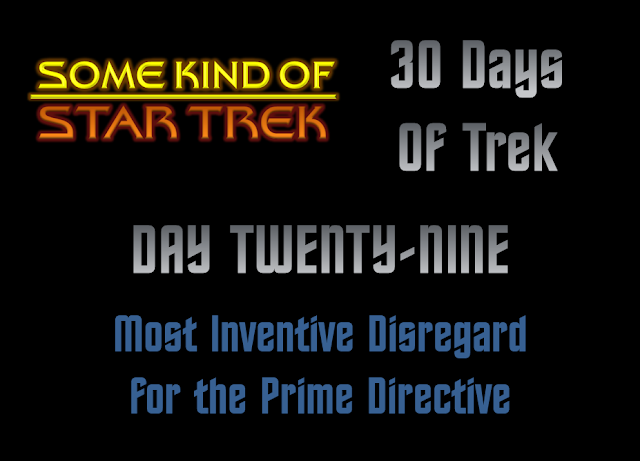 I actually think this may be Kirk's Greatest Mistake Ever (second place not checking on Khan) and he even does what he does best which is stroll away to the next mission without a care. Bravo, captain, bravo. It is a bleak future but it does mean we get to see Intendent Kira lay waste to a whole series of episodes which many would suggest was actually well worth ignoring the Directive point blank. So what was your favourite disregard for the Prime Directive and by who? Was it Kirk every time or did another character do it with more panache? Check back on all the previous questions HERE and join me for OUR FINAL QUESTION tomorrow. Remember that on October 31st there will be an Ask Me Anything opportunity to end the challenge!